Joris Joosen, founder of Backbone International, talks to TPMEA’s Stew Hume about the company’s growth in the Middle East events market. Starting as a freelance producer for Dutch entertainment and medium enterprise, ID&T, a young Joris Joosen had the foresight and vision to create a fresh venture. The goal? To provide a service that translated creative plans into feasible productions across the globe. Over the last nine years, Backbone International has attempted to cultivate this vision while maintaining high standards in efficiency, safety and quality. With a wide variety of services, the company supplies production management and technical production along with technical design and overlay management. Since its creation, Joosen [who currently takes on the role of Managing Director] has always wanted Backbone to live up to the ‘International’ name in its title. 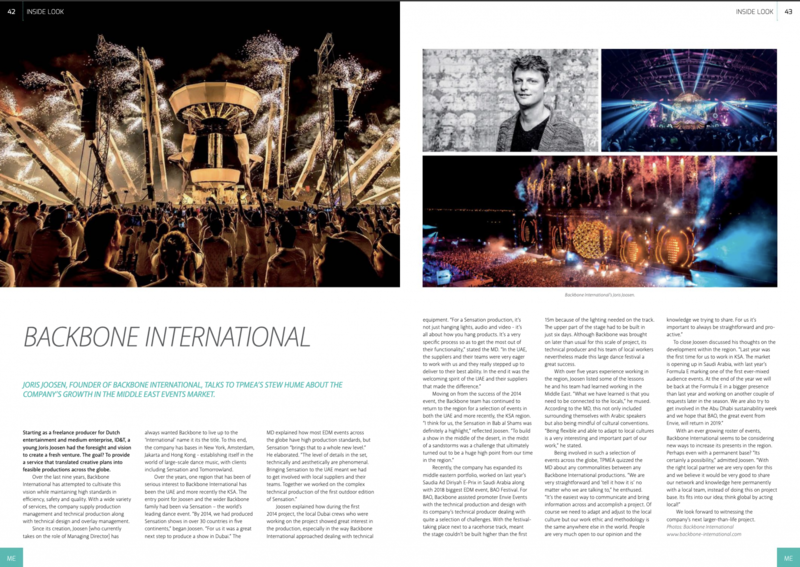 To this end, the company has bases in New York, Amsterdam, Jakarta and Hong Kong – establishing itself in the world of large-scale dance music, with clients including Sensation and Tomorrowland. Recently, the company has expanded its Middle Eastern portfolio, worked on last year’s Saudia Ad Diriyah E-Prix in Saudi Arabia along with 2018 biggest EDM event, BAO Festival. For BAO, Backbone assisted promoter Envie Events with the technical production and design with its company’s technical producer dealing with quite a selection of challenges. With the festival taking place next to a racehorse track, meant the stage couldn’t be built higher than the first 15m because of the lighting needed on the track. The upper part of the stage had to be built in just six days. Although Backbone was brought on later than usual for this scale of project, its technical producer and his team of local workers nevertheless made this large dance festival a great success. With over five years experience working in the region, Joosen listed some of the lessons he and his team had learned working in the Middle East. “What we have learned is that you need to be connected to the locals,” he mused. According to the MD, this not only included surrounding themselves with Arabic speakers but also being mindful of cultural conventions. “Being flexible and able to adapt to local cultures is a very interesting and important part of our work,” he stated. We look forward to witnessing the company’s next larger-than-life project.